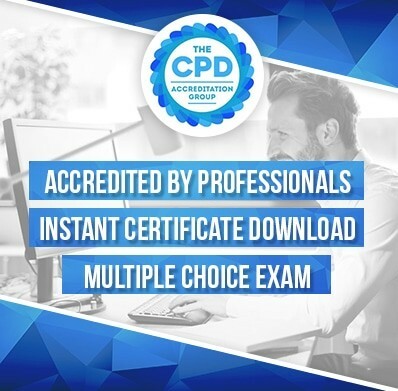 Certificate: A CPD Accredited Certificate is Instantly Available Upon Completion Certificate Cost: Free To Download Online As A PDF. Hard copies Sent To Your Address For £3.99 (Optional) Exam Type: Online Multiple Choice Assesment Exam Included: Exam Is Included In The Price Exam Retakes: Unlimited Retakes At No Extra Cost [/av_one_half] [av_hr class='default' height='50' shadow='no-shadow' position='center' custom_border='av-border-thin' custom_width='50px' custom_border_color='' custom_margin_top='30px' custom_margin_bottom='30px' icon_select='yes' custom_icon_color='' icon='ue808' font='entypo-fontello' custom_class='' admin_preview_bg='' av_uid='av-26z6pu'] Who we are We are an accredited and trusted leading provider across the UK. We have extensive experience in various private and public sectors environments. Our statutory, mandatory and specialist training courses are delivered in line with the relevant UK legislation and recommended practice including the Continuing Professional Development (CPD) The online nature of the courses means that they are affordable, but do not compromise the quality. We offer over 100 online training courses, developed specifically to meet the needs of individuals to meet both their responsibilities and job roles and are ideal for induction, awareness, knowledge and refresher training. Why participate in our active listening course Assessment Once you have completed the learning you will participate in a multiple-choice assessment, a pass mark of 75% is required. The online test is marked automatically, receiving an instant grade. Don’t worry if you don’t pass or want to improve your grade, you can retake the test unlimited times at no extra cost. Accreditation HL Online Training Provides continuing professional development (CPD) interactive accredited training courses online for both individuals and businesses allowing you to obtain certified CPD hours. Certificate All our courses are accredited by the Continuing Professional Development (CPD) and are nationally recognised. Once you have completed your assessment you will be awarded a free accredited certificate in PDF format which is immediately available. Hard copies of the certificate are available at an additional fee of £3.99. All evidence of learning and certification will remain on our system for your future reference. Course Format The course is delivered online via our bespoke e-learning portal, complete with both online “classroom” style and interactive user-friendly training and downloadable documentation to aid your learning. You can resume or stop your course at any time, remembering the exact point you were at. Course Duration This does depend on the level and experience of the individual, as a guide a level 1 takes 1 hour, level 2 takes 2 hours and level 3 takes 3 hours as an average to complete each course. You have 12 months to take the course, however, there is no time limit in which you need to complete the course. Tutor Support It's good to know help is at hand. We take pride in our customer service, offering dedicated tutor support offering you unlimited online email support whilst studying to help answer any questions you may have. Course Compatibility Our courses utilise a responsive design making it available on your desktop, laptop, tablet or mobile Device. We recommend using the Google Chrome Browser.